Global solar installations rose to 8.5 GW, up 20 percent from 7.1 GW in the first quarter. As a result, industry-wide factory utilization, production, shipments and revenue increased substantially, compared to the rather sluggish first quarter. Growth will be flat in the third quarter, after which global PV markets will see a moderate upward movement in the fourth quarter. Yingli in the first half of 2013 rode the wave of solar growth in its home market in China to retain the dominant position in the global business for photovoltaic (PV) modules. The company shipped 1,450 megawatts (MW) worth of solar modules to the merchant market in the first two quarters of this year, giving Yingli an 8.1 percent share of the market, according to a new report entitled “IHS Solar PV Integrated Market Tracker – Q3 2013” from IHS Inc. (NYSE: IHS), a leading global source of critical information and insight. Yingli’s share was up from 7.3 percent during the first six months of 2012. In all, company shipments in the first half of 2013 surged by 29.9 percent compared 1,110 MW during the same period in 2012. Yingli’s total revenue was 39 percent higher than that of No. 2 module supplier Trina Solar. This represents an increase from Yingli’s lead in the first half of 2012 of 27 percent over then No 2 player First Solar. 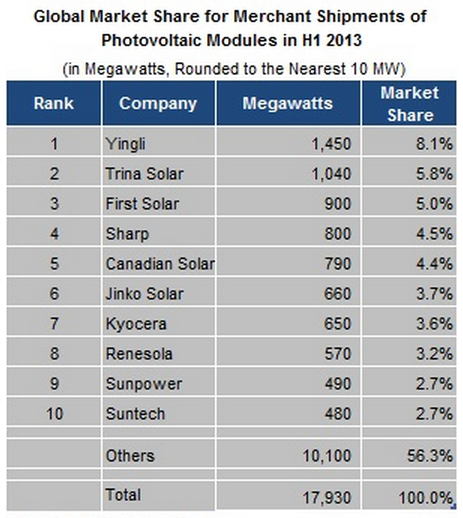 The attached table presents the Top 10 PV module suppliers for the first half of 2013, ranked by merchant shipments. Processing services and original equipment manufacturer shipments are not included. The PV module supplier ranking reflects the shift of global solar demand to Asia. China and Japan are the two fastest-growing markets for PV modules this year, and companies that have a strong presence in those countries increased their sales by the largest margins in the first half. No. 4-ranked Sharp of Japan saw its market share go up to 4.5 percent, up from 2.7 percent in the first half of 2012. Kyocera, the second-largest Japanese module supplier, managed to increase its share to 3.6 percent, up from 2.1 percent during the first six months of last year. Japan’s third-biggest player, Solar Frontier, also is on the rise. The company climbed to 11th place, up from 14th place during the same period in 2012, propelled by a 68 percent surge in revenue. In addition to Yingli, China’s Jinko Solar is growing fast. The company achieved a market share of 3.7 percent in the first half of 2013, up from 1.9 percent a year ago. Jinko benefited from its downstream focus with a strong project pipeline and remarkably low production costs. The fastest-growing module supplier of the first half of the year was Renesola, another leading Chinese company. Compared to the first half of last year, the company’s merchant shipments more than tripled in the first six months of 2013. “Renesola is sold out for 2013 and is already preselling its 2014 production,” Jin noted. While U.S.-based First Solar’s installation business is thriving, its module sales are suffering. Third-ranked First Solar struggled with a weak second quarter, causing its first-half market share to decline to 5.0 percent, down from 5.7 percent one year earlier. SunPower, the other leading U.S. supplier, grew slightly slower than the industry average. The ninth-ranked company’s merchant shipments increased by 14 percent in the first half of 2013—compared to 17 percent for the overall module business. REC, the only Top 10 module supplier of 2012 headquartered in Europe, kept merchant shipments stable at about 410 MW in the first half of the year. Despite slipping to No. 13, down from No. 9 in 2012, the company remains by far the leading European module supplier. Also in the second quarter, the solar polysilicon-to-module supply chain benefited from a boost in demand. Global solar installations rose to 8.5 GW, up 20 percent from 7.1 GW in the first quarter. As a result, industry-wide factory utilization, production, shipments and revenue increased substantially compared to the rather sluggish first quarter. Thanks to robust end markets and slightly increasing prices, margins improved remarkably in the second quarter. Several leading module producers reported double-digit gross margins. Jinko even achieved a net profit for the first time since the third quarter of 2011. IHS is reiterating its forecast that other module manufacturers also will return to profitability during the course of 2013. The high production, shipment, and revenue levels reached in the second quarter can be maintained for the rest of 2013, but continued strong expansion appears unlikely. Growth will be flat in the third quarter, after which global PV markets will see a moderate upward movement in the fourth quarter. Reprinted from materials provided by IHS, IHS Solar PV Integrated Market Tracker – Q3 2013.